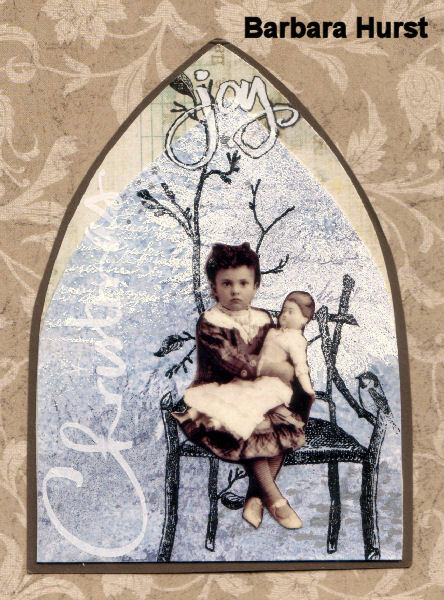 This weeks theme is the “Joy of Christmas/Children”…our hostess Barbara Hurst made this precious gothic arch using beautiful stamping techniques. What comes to your mind with this theme? Children under the Christmas tree opening gifts? visiting Santa? singing Christmas carols? Whatever your vision may be we wish to see it hear at Gothic arches this week. I had the pleasure of picking this week’s theme and hope you enjoy doing it as much as I did. I live in the desert west of the US. I have been stamping for 6 years, actively for the past 2 years. I have had many passions over the years and find rubber stamping and making backgrounds enjoyable because of the wonderful stampers across the world. I think that is what keeps my passion for stamping fresh, by seeing and learning from everyone else. Thanks to all of you who give me such inspiration each and everyday. I hope that everyone has a Wonderful Holiday and New Year. Cheers, too many more stamping opportunities in the New Year. Uups iám the first. Here is mine. Thanks for looking. Thanks everyone for joining in with me to make the Gothic Arch. Thanks Nancy for letting me pick the theme for today. Love this theme! Here’s my entry! Great theme! Here is my entry. thank you for this theme barbara ! Another fun arch theme. Thank you so much Barbara, yours is lovely! Here is my arch, I called it “Simple Pleasures”. Can’t wait till morning when I’ll have time to take a peek at all the great arches everyone has created! I’m amazed that so many people have already done it! Here is my arch. Thanks for this challenge. I have added my joy of christmas arch. You can find it here. This is my first Arch und my first entry here on Gothic Arches. Thanks for looking and Merry Christmas to you all!!! Here’s my contribution. Loved the challenge again. I posted my Arch today at http://www.art-interrupted.blogspot.com. Merry Christmas! Missed last week as over in Cologne but now I am back, full of cold and flu. Here is my simple entry for this week. Here’s my entry for this week. Hope you’re all enjoying the Christmas season. Here is my arch for this week!! You gals are oh so talented! I love looking at them all. This is my first time playing and hope to do some more with you. I finally created my arch for this week’s challenge! I am so enjoying these weekly challenges and enjoy looking at everyones’ art. I just love that chair! Here’s my Joy of Christmas/Children Arch!